A few travel pictures, finally, along with a book report. So I finally decided not to decide what to read on our trip to England and Amsterdam, thanks to being able to bring a bunch of stuff on my ipod. 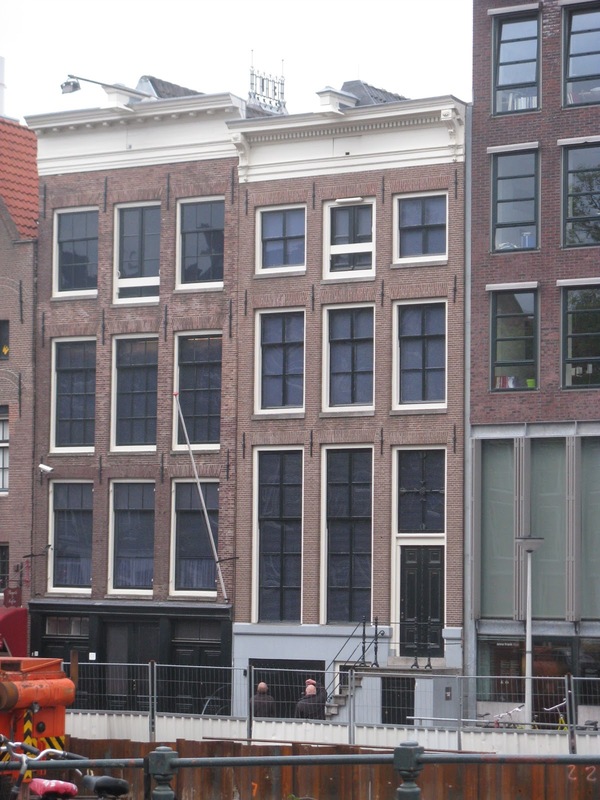 First up--on the plane--a preview of Amsterdam (well, 17th century Amsterdam). I read half of Rebecca Goldstein's book about Spinoza. I promise to read the second half soon. When we landed in London, The Rules said it was time for English reading, so I started Pride and Prejudice. No, no, no, I don't spend trips sitting around reading. Indeed, we had a great time seeing new sights (this is our nth trip), like the Churchill Museum and the Courtauld Gallery, walking from Richmond to Hampton Court, eating in good restaurants (go, Mildred's), browsing the incredibly lovable bookstores of London, etc. Big dilemma--whether to switch to Amsterdam reading when we got there, though I wasn't done with Pride and Prejudice. I confess (so shoot me) that I did not love the book--honestly, it seems like a romance novel for smart people. But I was fairly hooked, so no switching possible. I had brought The Coffee Trader, by David Liss, but didn't read it. Amsterdam is the new place where I wish I lived, instead of Dallas. There are quite a few of these places, with Edinburgh the front runner and Fairbanks, Alaska another favorite. (When it's 110 degrees--like it is right now--what kind of a person would dream of living in Hawaii?) I can't imagine having that sort of charm and beauty around me, day in and day out. My daughter and I took a lovely bike ride along the Amstel to a windmill near Amsterdam, and then beyond a ways, making me think the four of us should go on a big bike tour of Holland some day. Sadly enough, there are not yet four votes in favor of this idea. 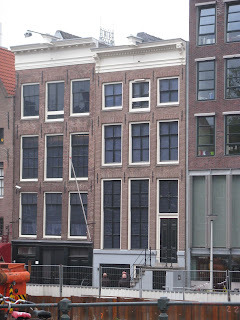 Going to Anne Frank house was the high point of the visit to Amsterdam. Having read her diary just before we left, seeing the house was extremely moving. You could imagine just what she went through in the years she spent there, and grasp the full horror of the family's being betrayed and deported to death camps. I found it extremely moving that this was the most packed "attraction" in Amsterdam. There were 1-2 hour lines, but no lines at all at the (of course amazing) Rijksmuseum and the Van Gogh Museum. Bicycles, bicycles, bicycles. Funniest sight--someone taking her horse out for some exercise. No, she wasn't on the horse. She was on a bicycle, leading the horse along beside her. On the way back to England, I dutifully attempted to read a book called Vermeer's Hat: The 17th Century and the Dawn of the Global World, by Timonthy Brook, but then I discovered the downside of digital books. The idiots who created the digital version forgot to include the pictures. Right, a book analyzing specific paintings wouldn't be that interesting, if you couldn't see the paintings. It was back to Jane Austen when we got to the other side of the channel, where we spent a few days driving to Oxford, Bristol, Bath, and Avebury. For the benefit of the book-loving 14s, we ran around looking for JRR Tolkien sites, visiting the college where he taught, his house, and the cemetery where he's buried. Plus (duh) all the Harry Potter sites, like the dining hall used as a model for the one at Hogwarts. The docents at Christ Church college told us it's just a bit tiresome having people constantly ask questions but Harry Potter, in a place with 800 years of history. Yes, well ... Actually, we asked proper questions about Henry VIII and the like. We really did. If it weren't for the long flight home, I might not have been able to make myself finish Pride and Prejudice. Sorry, but I can't swoon over Darcy, even if he is brooding, handsome, and attractively rich. Then again, when I got back home and finished the book, I found myself unable to switch to a different reading mood, and now I'm reading Mansfield Park. Go figure. I loved Emma, and have high hopes again.